The Graphical User Interface (GUI) for Linux provides you with an easier way to manage backups of your Linux servers and machines via the web. An alternative approach to script-based backup, the GUI lets you view and manage all connected Linux machines at one place, remotely. To initiate backup, all you need to do is setup your Linux servers and machines with the IDrive scripts package and login via the web. Download and configure your Linux machine with the IDrive scripts package. Login to the IDrive web interface, and all your connected Linux machines will appear in the Computers tab. Select the Linux machine you wish to backup and remotely configure backup set, manage backup schedules, settings etc. via the centralized web console. Alternatively use IDrive scripts package to protect your Linux data. After downloading the scripts follow the instructions provided in the readme.txt file or visit our scripts page for more information. The web-based console includes features and functionalities that help you easily backup your Linux machines. Manage your connected computers using the Graphical User Interface (GUI) – an alternative to script-based backups. View any number of Linux machines at one place and manage them remotely. 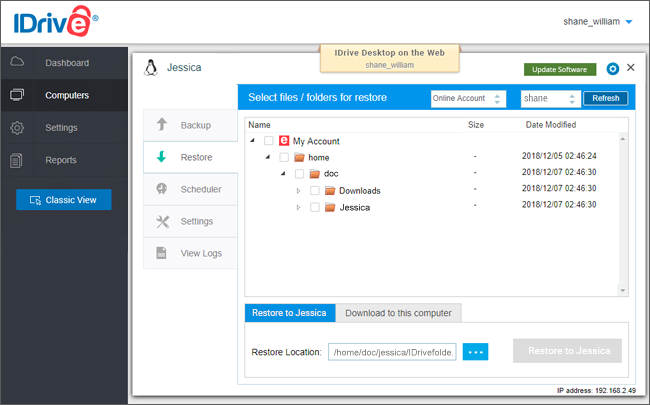 Choose files and create backup set to perform backups. Navigate through the web console with the help of visual elements. View and remotely manage all the computers linked to your account from the 'Computers' tab. 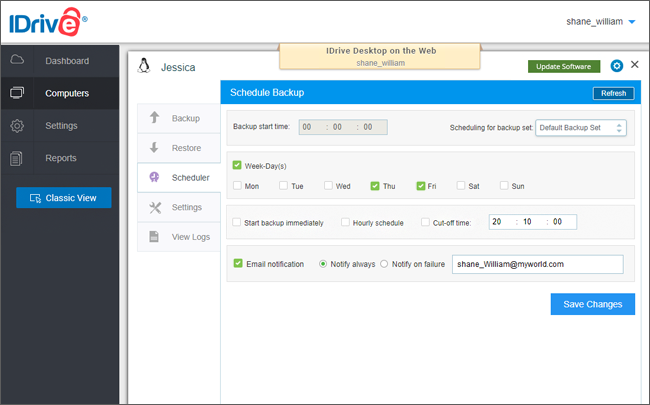 Remotely manage backup and restore settings, as well as schedule backups. Check the status of backups like most recent backup, time of backup, etc. 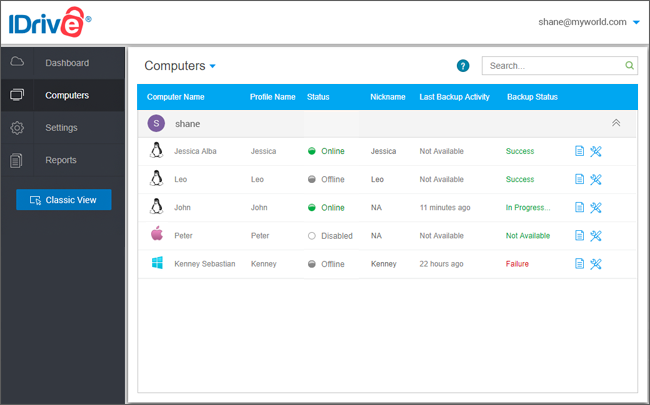 Securely manage your Linux machines along with PCs and Macs from the web. Define backup settings and manage your Linux machines efficiently. 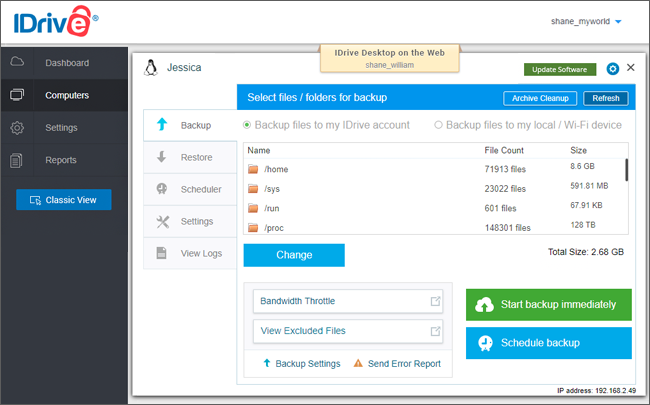 Select backup set, perform local backup or backup your files to the IDrive cloud. View activity logs of your account, and update package via the web. Enable Archive Cleanup periodically to delete data that is no longer needed. View all your connected Linux machines at one place and easily manage backups. 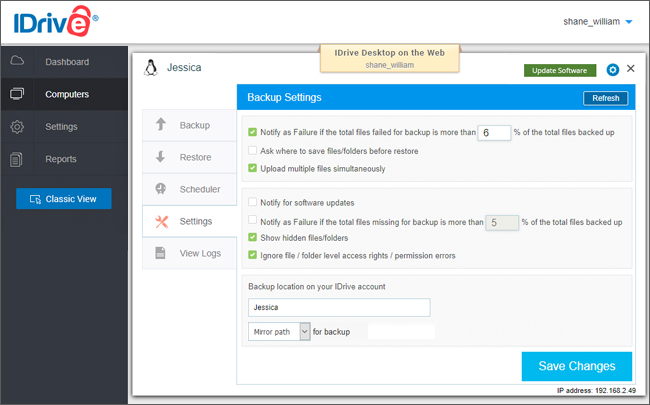 Select files/folders, create backup set to perform backups to your IDrive account. Easily restore backed up data to same or other computer from the Dashboard. Select specific days and time to schedule backups as well as define cut-off time to stop the backups. Manage settings – Receive notifications on backup failure and specify backup location.